German-born vocalist, Theo Bleckmann, now resides in New York. He has been described as a “sound painter” - on this CD he uses his instrument to create both broad brush strokes and delicate patterns, he has also composed most of the material. 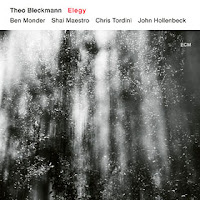 Bleckmann has had a musical association with guitarist Ben Monder and drummer John Hollenbeck for over two decades, but a more recent association with pianist Shai Maestro and bassist Chris Tordini. Elegy sets out to be an “exploration of death or transcendence in some existential way”. Bleckmann states that in this album he wants to “create songs that deal with this subject matter not in a morbid way, but with some light to it”. The CD consists of a series of songs contributing to the exploration, with short instrumental interludes, each of which are improvisations on Bleckmann's written material. Semblance is the first of these and rapidly moves into Comedy Tonight, setting Sondheim's words and arranged in memory of Bleckmann's mother, who died recently at the age of 91 still looking for things to make her laugh. Bleckmann's atmospheric take on Sondheim's lyrics are supported by Maestro's solo piano. Fields, followed by The Mission feature the whole band in balladic mood, with Bleckmann's vocalese floating over the instrumentalists. After another brief instrumental interlude – Littlefields - comes the title track, Elegy, which has a darker musical texture, through which emerges the more uplifting finale. To Be Shown to Monks at a Certain Temple, based on an 8th-century Zen poem by Chiao Jan, is about not giving up and exhorts the listener “not to think about death, but keep on moving; not to be morose, keep on living”. Another instrumental interlude - Cortege - precedes a short reprise of Elegy, leading into Take My Life. Bleckmann composed this thinking about Bach and his cantatas, especially “Ich habe genug” - Bach was looking forward to the afterlife; Bleckmann here imagines in his lyrics what it would be like to die, but ultimately finds “no other God but silence”. Wither (sic) – no h and no question mark - is another vocalese, no lyrics. This reverts to the ballad format with fine piano from Maestro, sensitively supported by the three other band members. A final instrumental improvisation, Alate, closes the set in a rising chordal progression, rather in the manner of an old black and white film ending, with a slowly closing iris ultimately forming a small central dot, followed by the word FIN. This is certainly a thought-provoking offering. The musicianship of all the band members is beyond question. I think it would probably pass Lance's Outré test. It is certainly unconventional (even for an ECM recording) and could possibly be considered bizarre. I do think that Bleckmann has probably achieved his objective and created songs that deal with this subject matter [exploration of death or transcendence in some existential way] not in a morbid way, but with some light to it.